Kathryn Legare (Mulholland) Woods was Co-Captain of the Cary Women's Basketball Team both her Junior and Senior year as well as a member of the All-Conference Team both years. 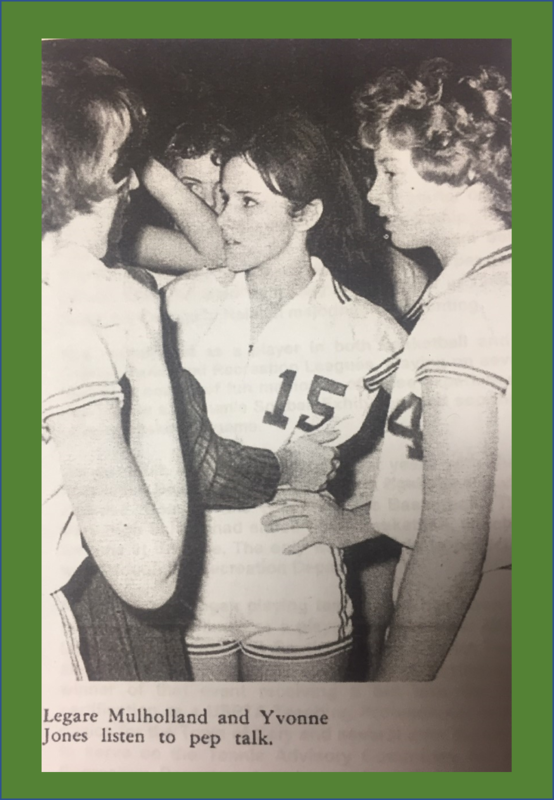 As a sophomore, Legare participated as a starter on the 1963 Cary High School Women's Basketball Tournament Championship Team. After graduation, she attended Hardbarger Business College in Raleigh majoring in accounting. In addition to basketball at Cary High, Legare participated as a player in boh basketball and softball in the Cary and Raleigh Parks and Recreation Leagues, playing on several District Championship teams. She once scored 54 points in a recreation basketball game and got a hit off of the legendary Kay Yow during a softball team. As an adult, she volunteered several years with teh Town of Cary Parks and Recreation Department as both a Girl's Basketball and Girl's Softball coach, being awared as "Coach of the Year" for basketball. (Note - this was during the time that Cary High School discontinued Girl's basketball, the only team sport offered for girls at the time). At age 30, Legare began playing tennis, and has been ranked in the State of North Carolina several times as a player. Seh and her Mixed Doubles partner won the Lipton Iced Tea North & South Carolina District Tournament earning a trip to the Nationals in Sawgrass, FL. She received her certification as a USPTA Teaching Professional and taught both junior and adult clinics for the Town of Cary and several area tennis clubs. A volunteer for the Town of Cary Tennis Advisory Committee, she has served as Tournament Director for several of the Town Tournaments. A resident of Cary, she volunteered to serve as Tournament Director for the American Heart Association Tournament as well as a multi-year Director for a local Cancer Benefit Tournament and the Kildaire Farms/MacGregor Junior Tournament for kids from all over the state of NC.